Since Apple avoided putting Near Field Communication into the iPhone 5, some in the mobile industry have begun to doubt the future of the personal data swapping tech. But NFC hasn't gone the way of Betamax and HD DVD yet. 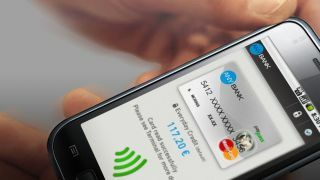 MasterCard released a software development kit today for it's contactless mobile payment system, PayPass, which uses NFC. The kit will help companies and third-party developers better integrate support for MasterCard's "tap-and-go" payment system into their own applications, complete with a user interface.This software could be used to support mobile payment apps, digital wallet apps or mobile banking. The SDK supports both Android and Blackberry OS 7 platforms.To help developers even more, MasterCard also sped up its approval process for services and apps that use PayPass. The toolkit includes API code libraries, API documentation, a developer guide, sample user interface application code, a white-label reference UI application, and a test suite for compliance. The white-label software will be especially useful for banks who want to create their own branded version of a contactless payment app supported by MasterCard. NFC is a mobile device technology that allows users to easily trade information in close proximity. One of it's more stimulating possibilities is its potential to be a safer and easier alternative to credit cards. However, there currently isn't enough infrastructure to accommodate as wide a use for the technology as a credit card replacement, though it's accepted worldwide. Consumers have also been slow to adopt the system. Many Apple fans were hoping the iPhone 5 would get NFC, but Apple decided to go with it's own service know as Passbook. However, Apple's service is only used to store gift and loyalty cards, and as a replacement for boarding passes and sports tickets. With no love from Apple, many in the tech industry wonder how far NFC can go without support from the taste-making giant. This might lead to another video/betamax or Blu-Ray/HD DVD situation, where progress is slowed by competing technologies until one gains dominance. However, MasterCard provided some research the promises a bright future for the NFC. According to Juniper Research, NFC will be included in 300 million phones by 2014 and a part of an estimated 74 billion USD in transactions by 2015. Also ABI Research estimates 85 percent of mobile devices shipped in 2016 will have some sort of NFC tech. MasterCard itself says it's approved apps for more than 70 smartphones including Samsung Galaxy S3, HTC One X, Sony Xperia S and the BlackBerry Bold 9900. The credit card company has also signed many deals in the U.K., Turkey and Germany to help proliferate NFC payment systems, including U.K. mobile company Everything Everywhere. The Bank of Montreal is also the first North American bank to offer some sort of contactless payment system. MasterCard's PayPass SDK is free to license.